Large, bright 1-room apartment (53 sq m); 4. Floor, south balcony, open kitchen with ceramic hob, oven, fridge and freezer, microwave, coffee and espresso machine; Bath / shower / toilet, cot, high chair, large living / sleeping room with 2 beds, 1 bed sofa for 1-2 people, new laminate flooring, armchairs, sofa, large dining table, radio / CD, flat screen TV, DVD player, Internet, bed linen and towels can be rented. Newly laid laminate flooring throughout the apartment! Ideal for large families: Our 2-room flat. (63 square meters) next door to rent! The apartment is located in the 4th. Floor of a multiple dwelling with lift. There is a flat-screen TV with many digital channels and a radio with CD player, of course, free Wi-Fi! The house has its own indoor swimming pool (12.5m x 6m) with sauna and relaxation room (the swimming pool and sauna area is in the mid season, from late October to late November and one week after Easter until early June, closed). The vestibule has been completely redesigned in 2017: new changing area, 4 new shower cabins, etc. There is a large recreation room in the house with 2 table tennis tables, ski storage and ski boot room (heated), bicycle storage, parking in the underground garage (height: 1.95 m, track width of the parking rail: 1.84 m), for larger cars: outdoor parking (can not reserved in advance), top location: near Parsennbahn and Bahnhof Dorf, approx. 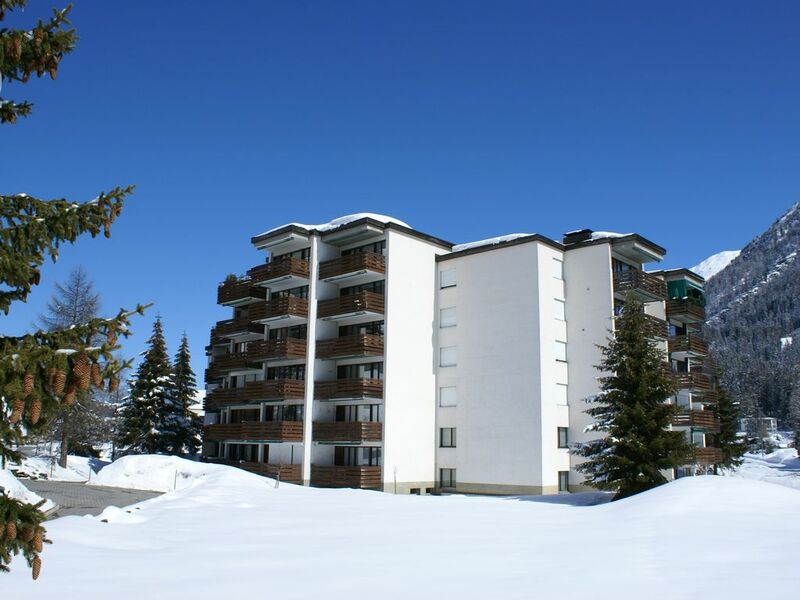 100m to the free bus in all directions, 5-8 minutes to the cross-country ski run, children's ski school and toboggan slope, shopping possibilities within walking distance in a few minutes, pets allowed. Under the item "Equipment" you will also find 360 ° pictures of the apartment! The contrasts of city and country are nowhere as visible in Switzerland as in Davos. In a few minutes you are from the center in another world. There are 700 kilometers of marked hiking, theme and panoramic trails through animal-rich forests, over unforgettable mountain landscapes and through wild romantic valleys. A stay in Davos is suitable for the leisurely walker, the sporty and sociable hiker and the ambitious mountaineer. In pool and sauna area, which can be reached by elevator in a bathrobe, there are 3 more showers. The kitchen is extensively equipped. Of course, coffee and espresso machine, kettle, toaster, fondue and raclette machine are available. we had a lovely stay in Davos and in your appartment.Thank you for a well equiped kitchen, ggod beds, nice and clean bathroom and everything else, good space! We hpoe to come back to Davos in a year or five, when our son will be a bit older,so that he can climb the mountains himself! Gepflegtes Appartement mit guter Ausstattung! Vom netten Kontakt zur Vermieterin zur sehr gut ausgestatteten Wohnung (schnelles WLAN, Küchenutensilien, DVDs, uvm) hat hier alles gepasst. Besonders gefallen haben uns auch der sonnige Balkon und der Schwimmbadbereich! zentrale nette Wohnung mit Balkon und guter Ausstattung + super Sauna und Swimmbad! Wir hatten einen erholsamen Urlaub in Davos. Direkt am Davoser See kann man schöne Spaziergänge machen. Mit dem Bus und auch zu Fuß kann man den idyllischen Ort gut erkunden. Unsere Ski Aktivitäten fanden meist auf PARSENN statt. Diese Talstation ist nur ca. 800m entfernt. Dort fanden wir ein riesiges Skigebiet mit u.a. 13 km langen und einsamen Pisten. Zum Freeriden war dies natürlich toll, da sich viele Möglichkeiten ergeben abseits der Pisten zu fahren. Im beachtlichem Schwimmbad und dem sauberen Saunabereich ist auch nichts auszusetzen. Einfach klasse! Gemütliche Wohnung - Toller Urlaub! Wir haben sehr gerne in dieser schönen Wohnung gewohnt. Die Ausstattung ist sehr gut. Das Sofa und die Betten sind sehr bequem und Bettwäsche und Handtücher waren sauber und weich. Warum einem Gast vorher Bettwäsche und Handtücher bemängelt hat, können wir nicht nachvollziehen. Besonders gefallen hat uns die Sauna und das Schwimmbad! Wir hatten eine super Woche in der Wohnung. Sie war sehr gut ausgestattet, sauber und hell. Die Sauna war sehr sauber und war nach einem aktiven Tag in den Bergen um Davos sehr willkommen. Die Kommunikation mit der VermieterIn (vor und während unserem Besuch) war sehr angenehm. Also Bestens zu empfehlen, wir kommen gerne wieder! Quality of sheets and towels was old and when I asked about coffee machine functionality, I got a “figure it out” type message. Other than that, all good. Wir können nicht verstehen, dass die Handtücher nicht ok gewesen sind, da neue Ware! Wir werden natürlich alle noch einmal überprüfen. Herr K. hat zum WEF ein Appartement gebucht, aber den Rundum-Service eines Hotels erwartet! Das ist leider nicht möglich! Die Wohnung hat einen hohen Standard in Punkto Ausstattung und Sauberkeit, wie die vielen positiven Kommentare unserer Feriengäste zeigen. Davos, the largest mountain resort in Europe, offers unforgettable experiences of nature and served at the same time a rich urban entertainment offer: over 320 km of ski slopes, halfpipes and freestyle areas for snowboarders, 100 km of groomed cross-country trails (classic and skating), wellness, toboggan runs, all sports, mountain inns and specialty restaurants, museums, nightclubs, theater, concert, cinema, billiard café, casino ... Davos is both town and country, action and relaxation, tradition and progress in one. And around the clock. A car is not necessary: ​​With the guest card you can use all the local buses for free. From May to November and several mountain railways in Davos and Klosters are free of charge! The stop for the buses in all directions is located approximately 100m from the house Seewiese. Golf: Davos Klosters with its 2 golf courses and 8 other places in the immediate vicinity, is a true golfer's paradise in the Alps. Thus you reach for Davos Klosters more than half of all golf courses in the Grisons in less than an hour. Whether you want to train through the romantic side valleys, on the FIS race trails in the Flüela or late at night on unserern floodlit trails - in the region Davos Klosters can be found in any case for your perfect piste. There are over 100 km of classic cross-country trails and 46 km of skating trails. They are separate and split into different levels of difficulty. Guests will also find special dog in Davos trails along the land water. There is no cross-country skiing vignettes duty! There are in 3 Tobogganing installations with a total length of 10 000m, the starting points are accessible by cable car. In addition, there is about 8 minutes walk from the house a sledge hill, which is ideal for small children.